Wash and cook the potatoes. Either we can pressure cook it with 2 whistles or boil the water, add potatoes and cook it until potatoes becomes tender. Chop the onions and cilantro and keep it ready. Once the potatoes are cooked, remove the skin and mash it using the fork or your hand. Don't mash it to a smooth paste, let ithere be some bits of potato left. Once the oil is hot enough, add mustard seeds and Hing. Once the mustard seeds pops add green chilies. Once it becomes little white, add the chopped onion. Mix it . Add turmeric powder, sprinkle little salt and mix it. Sprinkling salt helps the onion to cook faster. Then add the curry leaves and grate the ginger directly to this and mix it. Once the onion turns translucent, half mashed potatoes and remaining salt. Mix it and leave it on stove for a minute. Finally garnish with chopped cilantro/ coriander leaves and turn off the heat. We have the Potato-onion palya ready. We can use this palya to make bonda, you can use this as side dish to pooris and rotis too. Keep the Ingredients listed under "To Prepare The masala Dosa" ready. Grease and heat the skillet on medium heat. Once the tava is hot , rub the skillet using half onion. 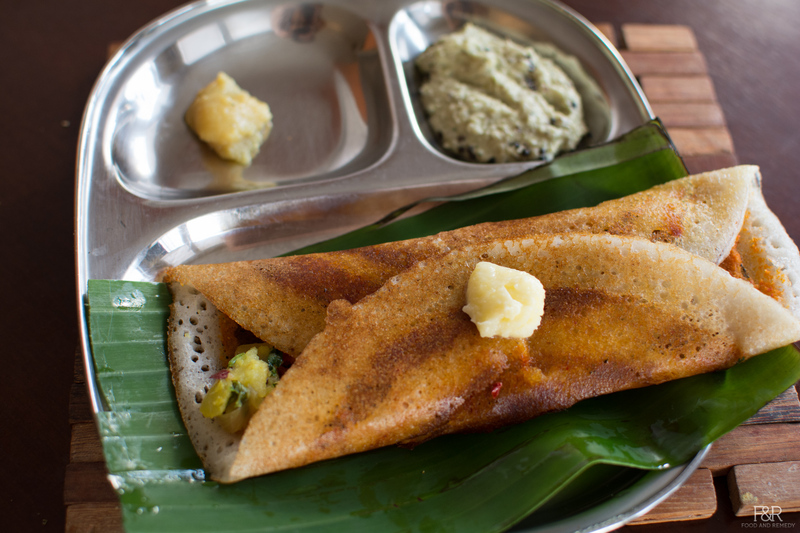 Take a ladle of batter, pour it in the center of the tava and spread it in circular motion to make the dosa. Pour generously the oil or butter or ghee all over the dosa. Ghee or butter tastes good compared oil. Cover it and let it cook for few seconds. Then take a spoonful of red chutney, spread it all over the dosa. Add little more oil/butter, reduce the heat and let it cook for few more seconds. Now take 3 to 4 tablespoon of palya and keep it in the center of the dosa. Leave it for few more seconds. The fold the Dosa both sides. There you go you have a restaurant style Mysore Masala Dosa ready to eat. Remember to rub the tava with the onion each time you make the Dosa. Repeat the same above procedures to make more masale dose and enjoy with coconut chutney. Can you please let me know where you got your cast iron skillet? How do you make the Dosa batter? Recipe please.